eulerr generates area-proportional Euler diagrams that display set relationships (intersections, unions, and disjoints) with circles or ellipses. 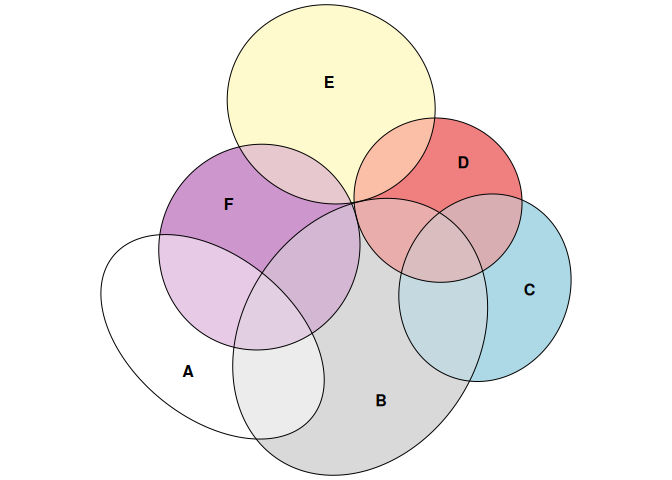 Euler diagrams are Venn diagrams without the requirement that all set interactions be present (whether they are empty or not), which means that, depending on input, eulerr sometimes produces Venn diagrams and sometimes not. With three or more sets intersecting, exact Euler diagrams are often impossible. For such cases eulerr attempts to provide a good approximation by numerically tuning the parameters of the ellipses or circles to minimize the error in the resulting diagram. Residuals and goodness of fit statistics are provided to assess whether the resulting diagram can be trusted. eulerr is also available as a shiny app hosted at eulerr.co. Please see the introductory vignette for a brief introduction or eulerr under the hood for details. eulerr is open source software, licensed under GPL-3. eulerr would not be possible without Ben Frederickson’s work on venn.js or Leland Wilkinson’s venneuler.